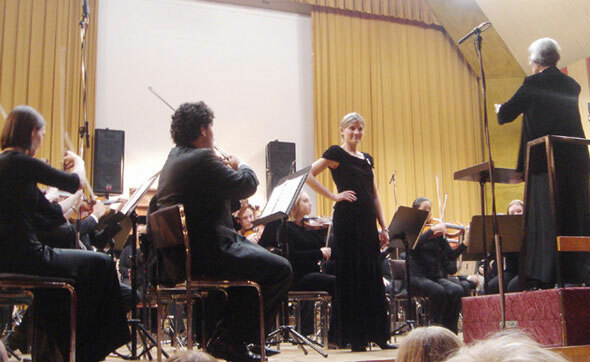 The SHSU symphony orchestra performs, with School of Music faculty member Kristen Hightower (in front of orchestra) performing a soprano solo and Carol Smith conducting, during the opening session of the International Alliance of Universities for Democracy conference in Pecs, Hungary, on Nov. 7. The group was in Eastern Europe for 10 days, performing at historical venues in Hungary, the Czech Republic and Austria. -Photo taken and submitted by School of Music chair Rod Cannon. The Sam Houston State University symphony orchestra recently returned from a 10-day trip in Eastern Europe, where the 84-member group, along with approximately 20 faculty, administrators, friends, parents and alumni, played at various venues in and toured the historic cities of Budapest and Pecs, Hungary; Prague, Czech Republic; and Vienna, Austria. The symphony traveled to Eastern Europe after being selected this past May to perform at the opening session of the conference of the International Alliance of Universities for Democracy, of which David Payne, SHSU provost and vice president for Academic Affairs, is an officer and executive board member. The symphony, conducted by Smith, represented the United States as TEAM USA 2004 at the conference, held Nov. 7-9 in Pecs. “ The importance of an American group appearing at this conference in which democracy was the focus was, of course, of special significance at this particular time in history,” Smith said. The performances in Hungary and Prague featured SHSU School of Music faculty members Andrew Wilson, violinist; Kristin Hightower, soprano; saxophonist Scott Plugge and composer Trent Hanna. Sheryl Murphy-Manley, SHSU musicologist, wrote the extensive program notes for the tour program, and Rodney Cannon, chair of the School of Music, gave formal introductory remarks at each of the concert venues. On Nov. 7, the students and faculty performed at 8 p.m. for the conference in at the University of Pecs, a university founded in 1922 that occupies the site of the first university in Hungary. “ The concert was given for a standing-room-only audience of conference participants and members of the local community,” said Smith. “All parts of the concert were apparently well received by the audience with an approximate five-minute ovation at the intermission of the concert and at least a 10 minute ovation at the end of the performance. “ An encore was performed, after which there was another extended ovation,” she said. University presidents and chancellors, representatives from the Hungarian National Radio and members of the international press, such as the New York Times, were in attendance at the performance. On Nov. 9, the symphony rehearsed and performed in Vienna, where many of the world’s most well-known composers including Beethoven and Mozart have lived and worked, at the double-spire, gothic church, the Votive Kirche. There, SHSU alumna and Vienna resident Melanie Holliday, who is also a well-known singer in Europe, performed with the symphony, which was again met with enthusiastic responses, according to Smith. Approximately 450 were in attendance at the performance. Also while in Vienna, the SHSU students were invited to attend a rehearsal of the Symphony Orchestra of the Music and Art University of Vienna, a music school that is the largest in the world with about 2,400 music students and 800 faculty. A third and final performance was given in the Holy Savior Church [Salvatore Kirche] in Prague on Nov. 12. About 200 guests attended the performance, eliciting three encores, two from Hightower with the orchestra and an additional one from the orchestra alone, Smith said. In each country, special folklore culture dinners were planned to give the tour participants a more broad view and understanding of each of the countries and their special music, dance, instruments, dress and language.